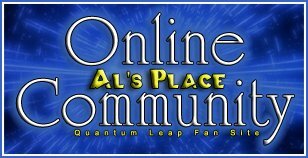 Welcome to Al's Place Online Community Messageboard and Chatroom! This online community and chatroom system is fully moderated and designed to provide a clean, friendly, and acceptable atmosphere for people of all ages to discuss Quantum Leap and related matter. While we (the administrators) do not frequently monitor the chatrooms, we reserve the right to archive transcripts of all conversations (general and private messages) in case a problem arises between members. Please take a moment and review the following posting and chatting guidelines to ensure that our objectives are achieved. The same rules apply for the posting forums and chatrooms. 1. Profanity is not permitted. It is unnecessary to convey your thoughts with excessive profanity since this board may have young people visiting. The words 'damn' and 'hell' are allowed within reason. Almost every other profane word will auto-censor using asterisks (****). Please don't try to use variations or obvious substitutions of profane words to get around the censor. You'll get warned and/or banned for that. This is an all-ages site. 2. Purposely degrading the personal lives of the stars of Quantum Leap or persons related to Quantum Leap or any member here without merit will be deleted. 3. Discussion of the sexual orientation of the stars of Quantum Leap or persons related to Quantum Leap or any member here will be deleted. There is no need to discuss this topic here. We are also not a dating service and this board and chatrooms are not intended to be used to initiate romantic relationships. If a relationship occurs through the normal course of things over time, the members involved should not use the board or main chatrooms to "court" each other as this interrupts other members' enjoyment of the site. You may start a private room if you like for such conversations, just make sure Al doesn't pop in on you! 4. Rudely attacking another member's opinion on any subject will not be tolerated. It is okay to disagree with another viewpoint, but use discretion and be respectful when responding to a post that you disagree with. 5. Displaying images of a graphic sexual nature, or anything deemed unsuitable for the eyes of a young person will be removed immediately. 6. Discrimination of any kind (racial, gender, or any other) is not tolerated. 7. Off-topic discussions should be confined to the 'Off-Topic' forum. "Off-topic" means discussion of anything other than Quantum Leap related material. If the conversation in a regular forum begins to go "off-topic", we will split the thread and move those posts to a new thread in the off-topic forum. 8. Fan-fiction stories may be posted in our 'Fan-Fiction' forums. However, we do not allow slash stories on this board. Also, DO NOT post anything offensive to the general public. 9. This board is for fans of Quantum Leap. If you are not a fan of the show, or are only here to harrass, taunt, or otherwise bother another member or members, we will ask you to leave and remove your posts. 10. Posting private messages, emails, or comments to you from another member is an envasion of privacy. Posts of this nature will be removed and the member warned. 11. Solicitation of non-Quantum Leap related websites or products for the purpose of generating traffic on those sites is prohibited. All posts containing solicitation will be removed. The user may also be banned. 12. Editing of posts: We reserve the right to edit posts made by all members. We will do this normally to remove long quoted text that is unnecessary, correct spelling mistakes for members who don't use the spell-checker, or to rename threads that go off-topic. In some cases, we may re-word a phrase or sentence if it does not fall within the guidelines of our posting rules or if light profanity is used for no reason. 13. Fluff posts should be kept to a minimum. Remember that this board attracts both new and old fans and all members want to be able to find what they are looking for. If a member is posting "yeah cool" or "good idea" after every post, that makes it hard to read the main discussion going on. It's considered fluff. These type of posts may be removed by the administrators without warning. DO NOT try to increase your status title (example: Project Observer) by posting fluff for no reason. 14. Please do not ruin the ending of the episodes either from the television series or virtual series. You can use a "spoiler tag" to cover what you want to write, then others can choose to highlight the covered text and read it if they so choose. Alternatively, some episode themes may be common knowledge to most fans, old and new. Please try and use good judgement when deciding to use the spoiler tag or not. All members should be aware that any discussion of any episode may produce some form of spoiler. 15. The board administrators reserve the right to change or add to these guidelines as the situation warrants. Adhering to these rules and guidelines will help to make this community a fun place for all fans of Quantum Leap to come together and discuss one of the best TV shows of all time! First Offense: A warning will be issued by the moderators. The warning will describe what is not acceptable about the post and may also result in moving the post into the garbage bin for review by the administrator. Second Offense: The administrator (alsplacebartender) will ban the username and I.P. address of anyone who has been warned once and has not corrected their actions. Any Serious Offense: In some cases where it is obvious that a member is purposely harrassing another member, we may ban you without warning. This is at the discretion of the administrators. Reinstatement after being banned from the board may occur if fifteen or more members (who have been active members for more than three months) vote to approve it. Voting will be done in a special forum assigned to those members interested. Polls will not be used for voting purposes in this situation. Voting will be open for two weeks. If enough votes are not received, the banned member may ask for another vote after six months has passed. If you agree with these guidelines and are willing to adhere to them, please feel free to start posting and chatting right now! We welcome new members and encourage you to leap back often and talk with us!